Shout! Factory Kids’ latest entry in its ongoing series of Littlest Pet Shop DVD, Littlest Pet Shop: Pet Stars is a star in itself among the bigger picture of the series’ current collections. The DVD, released Feb. 14, is yet another enjoyable collection of episodes for the whole family. That is due in part to the collection’s featured episodes and their sequencing. That will be discussed shortly. The episodes’ writing is just as important to note in examining this collection if not more than the episodes themselves. While it is a minute detail here, the series’ animation can actually be noted in the case of at least one of the collection’s episodes. Each element plays its own important part to the collection’s overall presentation. All things considered, this collection proves in the end to indeed be another enjoyable addition to the series’ current list of entries and another one of this year’s top new children’s DVDs. Shout! Factory Kids’ latest Littlest Pet Shop DVD Littlest Pet Shop: Pet Stars is yet another enjoyable addition to the series’ current list of home releases. It is also an easy, early pick for any critic’s list of the year’s top new children’s DVDs. That is due in part to the episodes that are featured on the DVD. As with the series’ previous DVD releases, this collection features five more episodes from the family friendly animated series. The episodes featured in this collection take families through the series’ second and third season. What truly stands out here is that the episodes are presented in relative chronological order from start to finish. This includes both overall and within the seasons themselves. ‘Heart of Parkness’ and ‘Standup Stinker’ are both lifted from Season Two while ‘The Secret Recipe,’ ‘A Night at the Pawza’ and ‘Sue Syndrome’ are all lifted from Season Three. On the surface, this seems like an unimportant element to examine. In the bigger picture though, presenting the episodes in almost the same order as they aired in their original television broadcast shows a dedication to properly transferring the episodes from television to DVD. Simply put, it’s an aesthetic element, but an important one nonetheless. To that end, it is still a highly important piece of the DVD’s overall presentation, and not the only important piece either. The writing behind each episode is just as important to examine as the episodes themselves. The episodes featured in Shout! Factory Kids’ latest LPS DVD collection are in themselves important to the DVD’s overall presentation. That is because they are presented in relatively the same order as they were in their original broadcast. This is not the first time that Shout! Factory Kids has taken such painstaking efforts to properly transfer the series’ episodes from television to DVD. That being the case, it makes this element well worth noting. Just as important to note in examining the collection’s overall presentation is the work of the show’s writers within each episode. The writing is notable first because of the stories that are at the center of each episode. The writing in the set’s opening episode “Heart of Parkness” shows that the episodes can and do entertain even when only one of the cast is a story’s focus. In this case, Sunil is the focus as he is separated from his fellow pet pals and is forced to defend a group of “native” raccoons in the park from a King Cobra. The setup for the story comes from the Biskit twins’ release of the exotic snake from their father’s pet store because of their own selfishness. Considering the very real issue of people having (many times illegally) exotic pets and the dangers posed therein, suspension of disbelief here becomes relatively easy. “Standup Stinker” is another key example of why the episodes’ writing is so important to note. The dual-pronged story line presented in “Standup Stinker” sees both Pepper and Minka following their own dreams, connecting both with plenty of humor along the way. This touches on another element of the writing that is so important to note–its pop culture references. True lovers of classic sci-fi flicks will enjoy the manner in which the writers spoofed so many classic sci-fi/alien flicks here as the pets try to make Minka believe she has become the first monkey on Mars right down to the poorly designed alien costumes. On another note, there is also a joke made through a reference to eBay at the episode’s end that only parents will appreciate. Speaking of jokes that only grown-ups will appreciate, the story at the center of “The Secret Recipe” is one that adults will enjoy just as much as their children if not more so. The story at the center of “The Secret Recipe” sees Blythe’s friend Youngmee Song pitching her not so tasty pet treats on a show called Bear Cave, which is very similar to ABC’s hit series Shark Tank. In the case of Bear Cave, the “hosts” are dressed in bear suits (yes, bear suits). The full-on spoof of Shark Tank highlights the often times silliness despite attempts by its heads to make it come across as something serious. That is shown through the “hosts’” reactions and their general personas as well as Youngmee’s pitch. The scenario is set up through a class project in which Blythe, Youngmee and their classmates have to develop their own businesses. Again, such a setup is believable as there are some schools (and teachers) who do use this teaching method in their classrooms in real life. It’s just one more way in which the writing proves so important to the DVD’s overall presentation. Together with so many other examples, it becomes clear why the writing is so important to the collection’s presentation. It still is not the last element worth noting here. The animation is, surprisingly, worth noting here, too. The episodes that make up the body of LPS: Pet Stars and the writing within each episode is important alone and collectively to this collection’s presentation, as has been pointed out already. While both elements are clearly important in their own right to the DVD’s presentation, they are only two of its most important elements. The show’s animation is a minute detail to note here, but is in fact worth noting in this case. That statement is supported partially in the design of the King Cobra in “Heart of Parkness.” Rather than make the snake a full-on scary character, the show’s animators maintained a King Cobra’s look but also made the snake not look too scary or menacing. By making sure the snake didn’t look too scary, the animators helped ensure even more engagement by the show’s younger audiences. The work of the series’ animators also proves important in “Standup Stinker” as they designed a famous comedian as the host of a comedy competition show. The animators took David Letterman’s tooth gap for the comedian’s design, crossed it with Conan O’Brien’s face and hair, and Jay Leno’s chin for quite the interesting hybrid figure. Just as with so much of the writing, this design is something that only adults will appreciate. On another note, the “hosts” of Bear Cave are an impressive likeness of the “sharks” on ABC’s Shark Tank; so much so that the “sharks,” if they see these designs, would be moved to laugh at the similarities between themselves and the “bears.” It’s just one more ways in which the animation proves so important to this collection of episodes. When it is set alongside the episodes, their sequencing and the equally impressive writing within each episode, the whole of these elements shows fully why this collection is a star among this year’s current field of new children’s DVDs. Littlest Pet Shop: Pet Stars is a star in itself among this year’s current crop of new children’s DVDs. That is, as already has been explained, due to the episodes featured in this collection and their sequencing, the writing within the episodes and even the animation featured in the series. Each element shows in its own way to be an important piece of the presentation’s whole. All things considered, they make Littlest Pet Shop: Pet Stars another enjoyable experience for audiences of all ages and—once again—one of this year’s top new children’s DVDs. It is available now in stores and online and can be ordered online direct via Shout! Factory’s online store. Blythe and her furry friends at the Littlest Pet Shop are back again. Shout! Factory Kids and Hasbro Studios released the latest collection of episodes from Discovery Family’s animated series Littlest Pet Shop today. 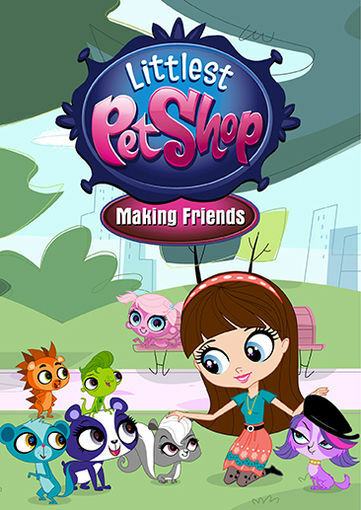 The DVD, Littlest Pet Shop: Pet Tales, offers audiences five more episodes filled with fun stories for the whole family. Each of the disc’s episodes present stories that will both entertain the whole family, and at times even teach some important lessons along the way all without being preachy in the process. This makes the disc’s episodes their own important element in examining the disc’s overall presentation. This will be discussed shortly. The episodes, with their entertaining and occasionally informative stories, are just one part of what makes this latest collection of LPS (as it will be called from hereon out) episodes so enjoyable. The writing within the episodes is once again just as important to note in this collection as the episodes’ stories. There are pop culture references that the entire family will appreciate throughout as well as jokes that children and adults will each appreciate alongside the episodes’ dialogue. Those more minor details within each episode complete the episodes’ stories. They are just one more part of what makes this brand new DVD another fun addition to any family’s home DVD library. The work of the show’s cast is just as important to note of its enjoyment as the stories within the episodes and their more minute details. That is because the cast’s interpretation bring not just their respective characters and the scripts to life but also they bring a certain substance to the series once again with their chemistry; a substance that will keep viewers of all kinds engaged in each episode. Each element proves to be equally important in its own right to the overall presentation of LPS: Pet Tales. Altogether they make this latest collection of LPS episodes another great addition to any family’s home DVD library and an early candidate for a spot on any critic’s list of the year’s top new Family DVDs. 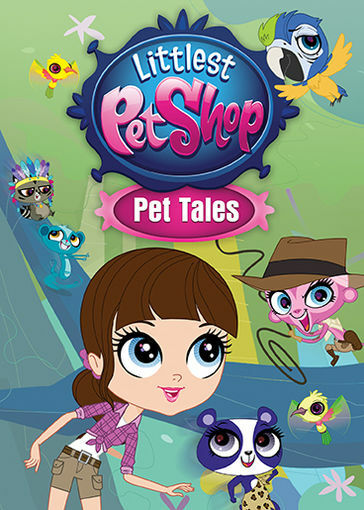 Littlest Pet Shop: Pet Tales, the latest collection of LPS episodes from Shout! Factory Kids and Hasbro Studios, is another wonderful addition to any family’s home DVD library. That is thanks in large part to the work of the series’ writers in regards to the stories crafted for each of the disc’s five featured episodes. Each episode presents its own share of entertainment throughout each one’s roughly twenty-minute run time. At the same time at least two of the episodes present some important secondary life lessons for young viewers. Whether or not those lessons were intentionally included in the episodes is anyone’s guess. The writers likely know for certain. Regardless the combination of that entertainment and information makes the episodes in this collection plenty of reason for audiences to purchase the collection. One of the most enjoyable episodes included in this collection is its lead episode “So Interesting.” This episode sees Blythe’s furry friends sharing stories about where they came from. Penny Ling however feels left out because she doesn’t have an interesting story to tell. So she comes up with a fantastical tale of fairies, goblins, and a watering stone. By the story’s end Penny has to admit that none of it was true and that she just made it up as she went along. After her admission her friends tell her that she didn’t have to make up her story to be interesting. They tell her that she is interesting just because she is herself. This leads to the embedded lesson about people simply telling the truth and being who they are. It emphasizes that friends who like a person for who said person actually is, are real friends. Again only the show’s writers know for certain if the lesson in question was intentionally included in the episode. Regardless the fact that the writers were not preachy in including said lesson makes the episode in whole that much more enjoyable. That sentiment is partially echoed in the DVD’s final episode “Proud As A…Peacock?” That episode centers on a neurotic, hypochondriac peacock (yes, you read right) who echoes hints of Woody Allen and Jack Lemmon’s Felix Unger from The Odd Couple. That will be discussed later in the notes about the more minute details of the writing in these episodes. Getting back on topic, Feud For Thought” is another episode that audiences are sure to enjoy. It employs an oft-used story line for its foundation. Blythe and her friends have to deal with Brittany Biskit after she and her sister have a temporary parting of ways thanks to Brittany scoring better on a test than her sister. So it’s up to Blythe and her friends to get the Biskit twins back together even if it means enduring their dual torment. This sort of story line has been used any number of times in other children’s shows including but not limited to Hey Arnold! and Recess. The twist that the writers used in the case of this episode kept the story original and just as entertaining as it is in the other noted series. On the other end of the episode Blythe’s furry friends have to deal with a pair of feuding koalas brought in to the pet shop. This leads to a division of the pets and eventually realization that they need to re-unite the koalas. What’s funny about the whole thing is that it playfully pokes fun at the age old story of the Hatfields and the McCoys here. Yet again this is another minute element of the writing that will be discussed more shortly. The fact that the writers could weave both storylines together so seamlessly is in itself quite impressive. This, just as much as the stories exhibited in each episode and their minute details, goes to show what makes the writing overall such an important part of each episode. The writers split each of the episodes into two parts that allow both Blythe and her pet pals their own story. This means even more entertainment for the whole family and in turn forms a solid foundation for the collection. The foundation established by the episodes’ primary writing is plenty of reason for any family to add this DVD to its home DVD library. As important as the primary writing is to the episodes it is just one part of what makes the episodes so enjoyable. The more minute details within the writing add even more enjoyment to each episode (and the collection in whole), proving even more why this latest episode compilation is so enjoyable for the whole family. The series itself is aimed at young female viewers. That is obvious. But as has been noted with previous LPS compilation discs, there are lots of smaller details included in each episode that will entertain not just girls but boys and even moms and dads. For instance, the writers included a not so subtle tribute to the Indiana Jones franchise in the lead episode here as Penny Ling makes up her story. And that the story is itself fantasy, male and female viewers alike will enjoy it. The fact that the writers used Penny Ling’s pet shop pals to fill out the story is in itself a time honored tradition that has been used in so many other series. This includes both animated and live action series. More often than not this sort of practice is used in shows when they use dream sequences in their stories. “Feud For Thought” plays on the classic Hatfield vs. McCoy story, only in this case the famed clans have been replaced with a pair of feuding koalas. Interestingly enough the koalas are owned by a pair of backwoods country hillbilly looking figures. Yes, the writers actually went there. The irony in that juxtaposition in itself is worth plenty of laughs. And seeing Sunil covered in watches as the “watch captain” of one side created by the koalas is worth just as many laughs. As if that isn’t enough the central character in “Proud As A…Peacock?” is not just any peacock. It is a neurotic, hypochondriac peacock that exhibits hints of Woody Allen and Jack Lemmon’s Felix Unger from The Odd Couple. It even has its own special pair of prescription glasses that make it look somewhat like Woody Allen in peacock form. And in “Fish Out Of Water” the pets encounter an alligator who is apparently from Minnesota, eh (yes, that was intended) as they search for Goldie the goldfish. The fun presented in the episodes’ minute details still doesn’t end there. The writers throw in a very subtle tribute to The Wizard of Oz in “What’s So Scary About The Jungle? Everything” that will only be caught by those paying close attention to the episode. It’s only a little moment. But those that catch it will find a bit of humor in its use and the very fact that it was used. There is so much more that could be listed here. But what is listed shows in its own right shows quite clearly why the minute details of each episode’s script are just as important to the episodes’ presentation as the episodes’ primary writing. Both elements are equally important to the collection in whole. That goes without saying. But together they make this collection just as enjoyable as the series’ previous episode compilations. The writing that went into each of the featured episodes in this new DVD is hugely important to its presentation. From the episodes’ primary story lines to their more minute details, to the ability of the writers to seamlessly tie together two story lines within each episode LPS’ writers are to be applauded for their efforts. Of course as important as their work was to each of the featured episodes their work is just part of what makes the episodes’ presentation so enjoyable. The work of the show’s cast is just as important as that of the writers. What’s really interesting is that Blythe’s pet pals are the real stars of the show yet again. Audiences will love watching Kyle Rideout (Deadpool, Packages From Planet X, Hop The Twig) as the voice of Vinnie the gecko in these episodes. When he takes on the voice of the “goblin” geckos in Penny Ling’s story he is especially entertaining. That is because he makes the “goblins” an almost surfer bum sort of persona rather than that of goblins. And while Mrs. Twombly largely takes a backseat to the rest of the characters in these episodes she is still so great to watch in the introductory scene of “Feud For Thought.” She is standing at the store’s front counter playing a handheld game as if she was a teen. It’s one more of those examples of what makes the writing’s smaller details so important to the episodes. In the same breath Kathleen Barr’s (Reboot, Dinosaur Train, Slugterra) handling of this moment will put a smile on any viewer’s face regardless of said viewer’s age and gender. On another note, Shannon Chan-Kent is just as entertaining as Blythe’s friend Youngmee Song here. There is one story that sees Youngmee trying to convince Blythe to use her ability to talk to animals for various schemes. Youngmee’s over-the-top enthusiasm for her own ideas is just as entertaining as the interactions of the rest of the characters. It is really one of those moments in which Chan-Kent really shines in her comic timing. It would have been so easy for her to ham it up so much more than she did in this mini-storyline. But she handled the moment with the fullest expertise. Because she did it makes her completely believable, and again entertaining. It’s just one more way in which the work of the voice cast proves to be so important to these episodes. There are so many other moments that could be cited such as Peter New’s (Agent Cody Banks, Scooby-Doo 2: Monsters Unleashed, InuYasha) handling of Sunil when he is made “watch captain” in “Feud For Thought” that prove it just as much. But there is not enough space or time to note every single notable moment. Keeping that in mind it is safe to say that the work noted here proves unquestionably that the work of the show’s voice cast is just as important to these episodes as that of the writers. All things considered the end result of the writers’ work and that of the cast is a collection of episodes that while small shows big, great things do indeed come in small stores…er…packages. Blythe and her furry friends at the Littlest Pet Shop return next month with another new collection of episodes. Shout! Factory Kids will release its latest collection of episodes from Discovery Family’s animated series Littlest Pet Shop next month. Littlest Pet Shop: Pet Tales will be released Tuesday, March 8th in stores and online. The DVD features five more episodes from the hit series, most of which are pulled from the series’ third season. One of its episodes, “So Interesting,” is lifted from the series’ second season. That episode sees Penny Ling come up with a completely outlandish story during a creative session among the pets. It is just one of the fun stories included in this collection of episodes that audiences will enjoy. In “Feud For Thought” things get kind of “wild” when a pair of arguing koalas causes chaos for the pets. And in “”Proud as a…Peacock?” it’s up to the pets to help a shy peacock prepare for its debut at the agricultural gardens. These are just some of the stories presented in this collection. Blythe faces her own challenge in “Fish Out Of Water” when she has to keep Josh Sharp from working for the Biskit twins. The pets even have their own adventure in that episode, too. That and so much more is in this collection. The DVD’s complete episode listing is noted below. 2 Littlest Pet Shop: What’s So Scary About the Jungle? Everything! 5 Littlest Pet Shop: Proud As A… Peacock? Labor Day has come and gone once again. The weather is beginning to turn for much of the country and has already turned for others. That means it won’t be long before Halloween is upon us once again. Even store shelves across the country are becoming filled with the annual bevy of Halloween fare. This includes the annual crop of Halloween DVDs and Blu-rays. The thing about Halloween is that it seems to produce the least amount of holiday programming in comparison to that of Thanksgiving and Christmas. Shout! Factory however is looking to help change that as it released yet another new Halloween DVD earlier this month in the form of the new Littlest Pet Shop DVD Littlest Pet Shop: Halloween Fest. This latest addition to the show’s already extensive series of DVDs is yet another welcome addition to any family’s home DVD library and yet another breath of fresh air among the annual holiday fare. The main way in which it proves itself such an enjoyable new set of episodes is the writing behind each of its episodes. While Littlest Pet Shop has always been aimed largely at younger female viewers, the writing in the featured episodes is such that the whole family will enjoy each episode. That will be discussed at more length shortly. The work of the show’s voice cast is just as entertaining as the work of the series’ writers once again. Last but hardly least worth noting to this DVD’s positives is the inclusion of a pumpkin stencil exclusive to the DVD. With many stores and farms already stocking their annual supply of pumpkins, the stencil is a great addition for any family in deciding what design to use for their jack-o-lantern this year or any year. Each noted element by itself proves its own value to the whole of Littlest Pet Shop: Halloween Fest. Collectively they show the DVD in whole to be a collection that is just as enjoyable in the realm of Littlest Pet Shop compilations as it is in the realm of new holiday DVD fare. Halloween is one of the slimmest times of the year when it comes to new DVD and Blu-ray offerings. Why that seems to be the case is anyone’s guess. Regardless each year there are some new releases among those slim pickings of new releases. The problem is that among those few new offerings, even fewer can truly be said to be worth the watch. Shout! Factory has one of those few fully worthwhile offerings once again in the form of the new Littlest Pet Shop collection Littlest Pet Shop: Halloween Fest. The main way in which it proves this is in its writing. At the center of the writing’s success is the script for each of its five episodes. All five episodes featured in this collection feature their own frightfully fun stories that are fitting for the whole family (say that one five times fast). It all kicks off with the absolute laugh riot “Door-Jammed.” This episode sees Blythe’s animal friends believing that each one is a monster after having watched a movie about a werewolf. Meanwhile Mrs. Twombley sets out to claim a doorknob (yes, a doorknob) away from her arch-nemesis Mr. Biskit. The LPS pals meet a new eight-legged friend in the collection’s second episode “Eight Arms To Hold You.” This episode is a good fit for the collection thanks to the execution of its story. As the story progresses, it is believed that the octopus is actually a monster. That’s because the new pal was kept in the shadows much in the vein of so many classic monster movies. And that will be discussed shortly as it is another element of the episodes’ writing that makes these episodes so enjoyable. As if the stories already noted aren’t enough to convince families, there is an equally enjoyable story in “War of the Weirds” the third of the DVD’s five episodes. The very title is itself a tribute to the classic sci-fi flick War of the Worlds. The episode itself will have viewers laughing till their sides hurt as the LPS pals become afraid that aliens are invading. There is an interesting twist at the episode’s end that makes for just as many laughs. On another level, the episode makes great reference to one of the funniest stereotypes of the alien conspiracy theory culture out there today. That is yet another more minute detail of the episodes’ writing that makes them so enjoyable, which will also be discussed shortly. Getting back on the subject at hand, all three of the stories noted here are in their own right prime examples of how the writing behind this collection’s episodes makes them so enjoyable. That is hardly to take away from the remaining pair of episodes–“Pawlm Reading” and “The very Littlest Pet Shop.” Both episodes make for their own share of enjoyment, too. All five episodes considered together make Littlest Pet Shop: Halloween Fest well worth the watch within themselves. They are just part of the writing that makes this collection so enjoyable, too. There are smaller details within each episode that make each one even more enjoyable and the collection in whole that much more enjoyable. The stories presented within each of the episodes featured in Littlest Pet Shop: Halloween Fest give viewers plenty of reason to pick up this new collection of Littlest Pet Shop episodes. They are only part of what makes the writing so enjoyable within each episode. The smaller details included within each episode’s script adds even more enjoyment to the whole of the DVD. One example of how the episodes’ more minor details make the writing even more enjoyable comes in the set’s lead episode “Door-Jammed.” The writers make direct reference to the hit Hobbit movie franchise as well as Michael Jackson’s famed Thriller video complete with narration just as the actual video had courtesy of Vincent Price. The manner in which the writers kept the octopus in the shadows through much of “Eight Arms To Hold You” is very much in the vein of Hollywood’s classic monster movies. Those movies would build tension by not revealing the monsters until late in the movies’ run. One could even argue that the use of an octopus is in itself a direct throwback to the classic 1955 sci-fi/horror hybrid It Came From Beneath The Sea. In “War of the Weirds” the writers pay homage to the classic 1953 sci-fi flick War of the Worlds. There is also a hilarious reference to the stereotype of conspiracy theorists using tin foil hats to keep the invasion forces from controlling their minds. And just as interesting in this episode is the playful jab at the stores that employ people to stand on street corners and spin signs while dancing in order to get attention. These are just a handful of examples of how the more minor details of the episodes’ writing makes them so enjoyable for audiences of all ages. There is just as much that could be noted from “Pawlm Reading” and “The Very Littlest Pet Shop,” which in itself throws back to the likes of 1957’s The Incredible Shrinking Man. The ultimate reveal in this episode won’t be given away here for the sake of those that haven’t seen this episode (or any of the set’s others). But it is a timeless plot element that has been used time and again in so many other TV series and movies. Whether for that element, for any of the other minor details of the writing or for the stories themselves, it should be fully clear by now why exactly the writing behind the episodes featured in Littlest Pet Shop: Halloween Fest is so important to its overall success and enjoyment. All things combined, the writing makes each of the set’s five episodes enjoyable not just for its target younger female viewers but for the whole family. Having noted this, there is still plenty more to note in regards to the enjoyment of Littlest Pet Shop: Halloween Fest including the work of the series’ cast. The work of the writers behind Littlest Pet Shop has clearly paid off in spades in this collection of episodes. All five featured episodes include something that at least one member of any family will appreciate if not the whole family. This includes both the episodes’ stories and the more minor details of each episode. For all of the enjoyment generated through each of the episodes’ writing, the work of the show’s voice cast makes for just as much enjoyment. Lead voice actress Ashleigh Ball (Johnny Test, My Little Pony: Equestria Girls, Pac-Man and the Ghostly Adventures) is just as solid as ever in her portrayal of Blythe Baxter throughout each episode. One instance in which this is clear comes when she is trapped in a bathroom with one of the Biskit twins at the Biskits’ mansion. Not once here does she try to ham it up as Blythe connects with said girl. Even at other points in which Blythe takes a back seat to her cast mates, Ball is just as entertaining. Viewers can really feel the respect that she has for her cast mates in those moments, which are themselves included in this collection. Peter New’s (Scooby-Doo 2: Monsters Unleashed, Agent Cody Banks, The Imaginarium of Doctor Parnassus) work as the voice of Sunil Nevla is another of the high points of the cast’s voice work in this collection. New maintains his place as the comedian of the cast as he brings Sunil to life, spewing out conspiracy theories and coming up with all kinds of outlandish thoughts. One can’t help but wonder in listening to New’s delivery just how much of his work was ad-libbed and how much was actually in the scripts. Even if he did stick to the episode’s scripts, his timing was still impeccable, making for so many laughs in the long-term. Supporting actress Kathleen Barr (Reboot, Kid vs. Cat, Adventures of Sonic The Hedgehog) is just as impressive as the voice of Mrs. Twombley. Her delivery as she searches for and finds the doorknob she bid on in “Door-Jammed” will have both those familiar with the hugely successful Hobbitt series and those more familiar with Littlest Pet Shop laughing just as much as the other. While Barr, New, and Ball each add their own enjoyment to these episodes, their work is not the only entertaining work featured throughout the set. Each of the cast members could just as easily be noted for their work, too. 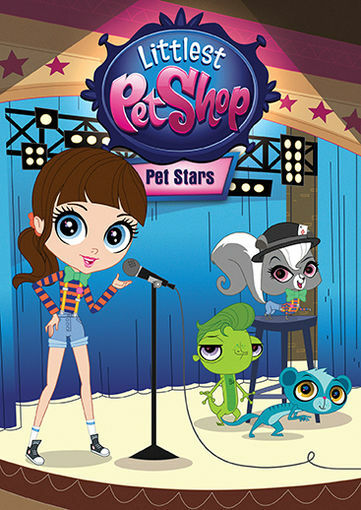 Altogether, the work of the show’s voice cast plays just as important of a role in the enjoyment of Littlest Pet Shop: Halloween Fest as the work of the show’s writers. The writers and cast together make each episode well worth the watch each time as the days close in on Halloween. Together, they make even clearer why this collection is such a breath of fresh air among this year’s holiday offerings. While both elements do plenty to show why this collection is so enjoyable, they still are not all that make it a wonderful new addition for families. The inclusion of a free bonus pumpkin stencil rounds out the ways in which the DVD proves itself so enjoyable. 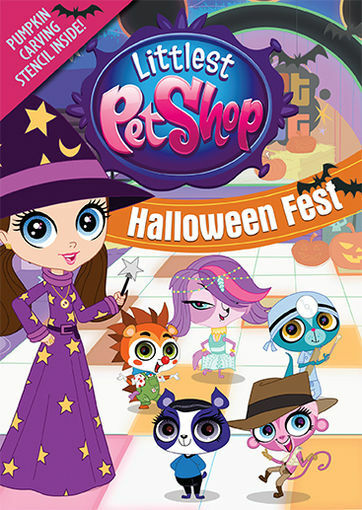 The work of both the writers and the cast within each episode featured in Littlest Pet Shop: Halloween Fest shows clearly why this new DVD is a breath of fresh air among the otherwise stagnant collection of holiday offerings on store shelves each year. For all of their collective importance in the bigger picture of the DVD, there is still one more element that makes the presentation whole here. That element is the bonus pumpkin stencil included inside the case. Now that fall is here, stores and farms are all beginning to pull out their annual stock of pumpkins for people to carve up and put on their porches. The stencil included in this DVD gives a great idea for fans of Littlest Pet Shop. The main reason that it is such a great addition is that it gives young Halloween lovers and fans of the show a starting point for their own original jack-o-lantern design. It also serves as another great opportunity for parents and children to do something together to get into the Halloween spirit all while celebrating younger viewers’ love of Littlest Pet Shop. Simply put it’s a double whammy for the whole family (hey, it rhymes). It gives the carver (whether it be adult or child) a clear explanation of where to and where not to cut their pumpkins. So it’s also user-friendly so to speak. Considering all of this, the bonus pumpkin stencil included in Shout! 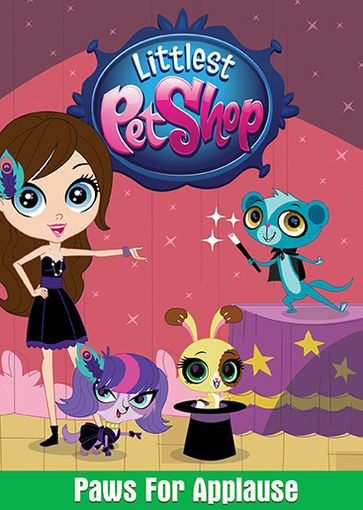 Factory and Hasbro Studios’ new Littlest Pet Shop DVD is just as much reason to pick up this new DVD as the work of the show’s writers and cast. All three elements together make this DVD a breath of fresh air among this year’s crop of holiday DVD and Blu-ray offerings. Halloween is right around the corner. As many know, it is the unofficial start of the holiday season. That means it won’t be long before the annual crop of holiday programs hit the airwaves, and DVDs and Blu-rays hit store shelves. The thing is that Halloween seems to produce the least amount of holiday programming in comparison to that of Thanksgiving and Christmas. Shout! Factory however is looking to help change that as it will release a new Halloween-themed DVD from Discovery Family’s hit animated series Littlest Pet Shop next month for the whole family. Shout! Factory has announced that on Tuesday, September 1st it will release Littlest Pet Shop: Halloween Fest. Littlest Pet Shop: Halloween Fest offers audiences five more episodes pulled from all three current seasons of the beloved animated Discovery Family series. It opens with Season One’s “Door Jammed.” This episode Blythe’s pet pals think that some of their own have been turned into werewolves when they start howling sounds coming from inside the pet store. The episode’s secondary storyline sees Blythe join Mrs. Twombley in the search for a coveted doorknob at a mansion that offers its own frightful fun. “Eight Arms To Hold You,” from Season Two, has Russell seeing things—more specifically a giant octopus-like creature trying to eat him—after Sunil and Vinnie accidentally cause a city-wide power outage. Another of the episode’s story lines has Russell believing that a ghost is stealing Mrs. Twombley’s supplies. And in Season Three’s “War of the Weirds,” Blythe’s animal friends believe that the truth is out there. Blythe however is suspect and tries to help them figure out what they have actually seen in the sky. These are just a few of the episodes that make up the body of the frightfully fun new Littlest Pet Shop DVD Halloween Fest. The complete episode listing for the DVD is noted below.